Wave 1: Inclusive, quality, first teaching for all. Wave 2: Additional interventions to enable children to work at age-related expectations or above. Wave 3: Additional, highly personalised interventions. Quality, inclusive teaching which takes into account the learning needs of all the children in the classroom. This includes providing differentiated work and creating an inclusive learning environment. Create intervention and / or focus groups e.g. for lower, middle and higher ability students. Set tasks to individual learners, groups or the whole class within seconds. Personalise and differentiate existing content and create new bespoke activities. Specific, additional and time-limited interventions provided for some children who need help to accelerate their progress to enable them to work at or above age-related expectations. 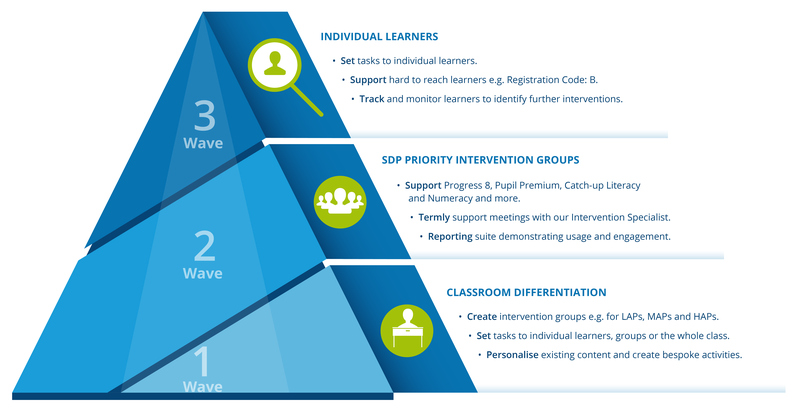 Wave 2 interventions are often targeted at a group of learners and are part of a school wide or School Development Plan initiative. Support Progress 8, Pupil Premium, Catch-up Literacy and Numeracy and many more. Termly support meetings with our Intervention Specialists which are former senior leaders within schools. Real time reporting suite demonstrating usage, engagement and student progress. All reports can be printed and exported into any format. Targeted provision for a minority of children where it is necessary to provide highly tailored intervention to accelerate progress or enable children to achieve their potential. This may include one to one or specialist interventions. Set tasks to individual learners within seconds. Track and monitor learners to identify further interventions. A series of independent studies by FFT (Fischer Family Trust) were conducted over a 10-year period including hundreds of thousands of students per year. Students with 10 hours of e-learning during an academic year – equivalent to two 10-minute activities per week – consistently showed significant impact on progress. All students improved and students with low prior attainment improved nearly double the average. SAM Learning’s Targeted Intervention is featured on ‘Shaping the Future’, a programme produced by ITN Productions on behalf of FASNA (Freedom and Autonomy for Schools – National Association). ‘Shaping the Future’ is introduced by national newsreader Natasha Kaplinsky and features key industry interviews and news-style reports along with sponsored editorial profiles. The programme was released in November 2017.